As Democrats prepare to introduce ‘No Ban Act’ legislation to end what they say is President Donald Trump’s racist Muslim ban they should take a moment to read the new Government Accountability Office report issued Thursday. It shows that under President Obama the travel ban rate for security reasons in 2015 was 16 times higher than under Trump in 2017 based on the one year data that was available to GAO. It also indicates a very significant finding: that the Trump administration’s executive orders not only did not increase its refusal rate -for terrorism and security related reasons- but it was lower for the respective years studied. “GAO’s analysis indicates that, out of the nearly 2.8 million NIV applications refused in fiscal year 2017, 1,338 applications were refused specifically due to visa entry restrictions implemented per the executive actions,” stated the report. For example, in 2015, “CBP data showed that it identified and interdicted over 22,000 high-risk air travelers through these programs” according to the most recent data available at the time of GAO’s report it stated. ONLY 1,338 VISA APPLICATIONS WERE REFUSED BECAUSE OF THE PRESIDENT TRUMP’S VISA ENTRY RESTRICTIONS FOR PEOPLE FROM CERTAIN COUNTRIES IN 2017 – THESE REFUSALS WERE TERRORISM OR SECURITY RELATED CONCERNS. Nonimmigrant visa’s are those issued to foreign nationals seeking admission into the United States. Some examples are visas issued to tourists, students and businessmen seeking temporary status. The report noted that previous successful and attempted terrorist attacks against the United States raised questions about the U.S. vetting system. One example listed in the report was the December 2015, terrorist attack in San Bernardino, California, which led to the deaths of 14 people with dozens more injured. One of the attackers was admitted into the United States under a nonimmigrant visa, stated the report. President Trump issued his executive travel ban in 2017 based on the apparent lack of vetting and what some security analysts described as an “open gateway” for applicants from nations affiliated with terrorist organizations. “Trump’s ban was not targeting Muslims it was using common sense to keep dangerous persons from entering the country through the visa system based on factual evidence of past attempted attacks and ones that we couldn’t stop,” said a DHS official, who was not authorized to speak to the media. State data indicate that more than 90 percent of NIVs refused each year from fiscal years 2012 through 2017 were based on the consular officers’ determination that the applicants were ineligible nonimmigrants—in other words, the consular officers believed that the applicant was an intending immigrant seeking to stay permanently in the United States, which would generally violate NIV conditions, or that the applicant otherwise failed to demonstrate eligibility for the particular visa he or she was seeking. For example, an applicant applying for a student visa could be refused as an ineligible nonimmigrant for failure to demonstrate possession of sufficient funds to cover his or her educational expenses, as required. The numbers are important. Why? 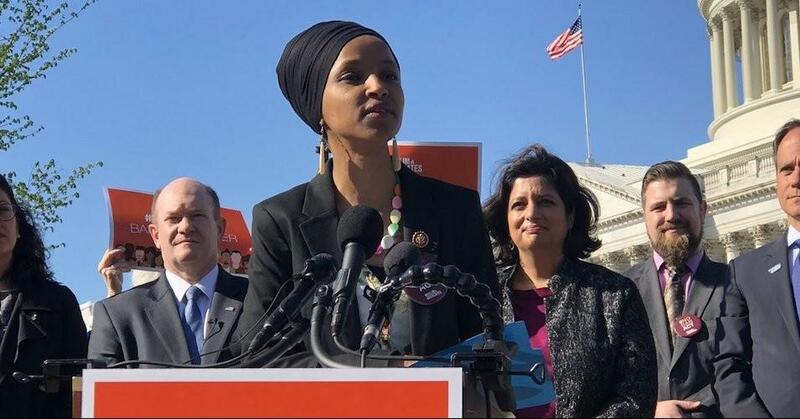 Because some Democrats, led by Minnesota Rep. Ilhan Omar, have introduced “The No Ban Act,” which directly targets the Trump administration’s travel ban policy. The policy prevents persons from nations such as Iran, Libya, Syria, Yemen and Somalia from entering the country. The reason being, is that the majority of these nations do not have a functioning government capable of documenting or clearing those traveling to the United States and concern that some of these countries are safe-havens for terrorist organizations, as listed by the State Department. Last year, Trump’s third executive travel ban order was upheld in a 5-4 ruling by the Supreme Court. Chief Justice John Roberts, who authored the majority opinion, noted that the president was within his authority to impose the ban. Trump based the ban on extensive national security concerns regarding travelers from these nations. Roberts opinion noted it was not the court’s place to pass judgment on Trump’s previous comments during the campaign regarding immigrants. Justice Sonia Sotomayor, wrote the dissenting opinion, and said Trump’s comments targeting Muslims should have been the reason to strike down his travel ban. Omar’s bill, however, will face a steep battle in Congress and the Senate. It would effectively end Trump’s policies to limit entry from these unstable and mostly ungoverned nations. It would also limit the government ability to conduct extreme vetting of immigrants who attempt to comet to the U.S. from countries designated as a threat because of ties to terrorism. “The Muslim ban is a moral stain on our country’s history,” Omar said. “Proud to have joined my colleagues in introducing the #NoBanAct yesterday to put an end to this discriminatory ban,” Omar said on Twitter. Omar could not be immediately reached for comment. 1,338 visa applications were refused because of the President’s visa entry restrictions for people from certain countries. 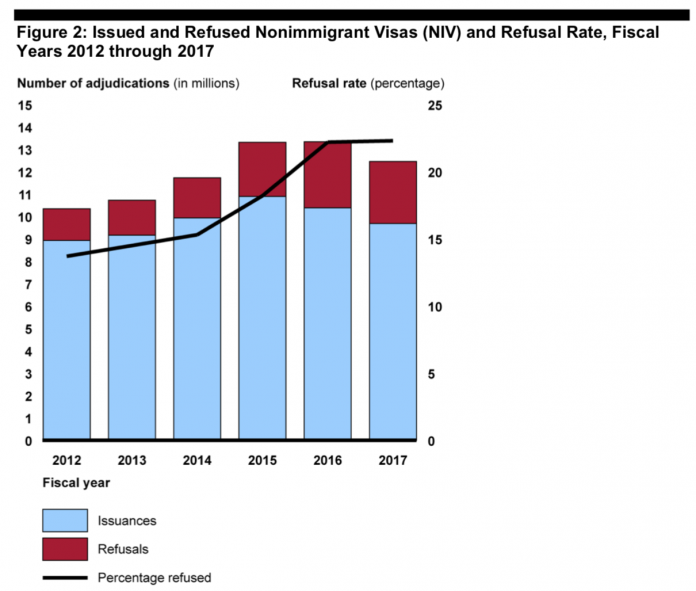 In August 2018, GAO reported that the total number of nonimmigrant visa (NIV) applications that Department of State (State) consular officers adjudicated annually increased from fiscal years 2012 through 2016, but decreased in fiscal year 2017 (the most recent data available at the time of GAO’s report). GAO’S ANALYSIS INDICATES THAT, OUT OF THE NEARLY 2.8 MILLION NIV APPLICATIONS REFUSED IN FISCAL YEAR 2017, 1,338 APPLICATIONS WERE REFUSED SPECIFICALLY DUE TO VISA ENTRY RESTRICTIONS IMPLEMENTED PER THE EXECUTIVE ACTIONS. NIVs are issued to foreign nationals, such as tourists, business visitors, and students, seeking temporary admission into the United States. The number of adjudications peaked at about 13.4 million in fiscal year 2016, and decreased by about 880,000 adjudications in fiscal year 2017. State refused about 18 percent of adjudicated applications during this time period, of which more than 90 percent were because the applicant did not qualify for the visa sought and 0.05 percent were due to terrorism and security-related concerns. In 2017, two executive orders and a proclamation issued by the President required, among other actions, visa entry restrictions for nationals of certain listed countries of concern. GAO’s analysis indicates that, out of the nearly 2.8 million NIV applications refused in fiscal year 2017, 1,338 applications were refused specifically due to visa entry restrictions implemented per the executive actions. In January 2017, GAO reported that the Department of Homeland Security’s (DHS) U.S. Customs and Border Protection (CBP) operates predeparture programs to help identify and interdict high-risk travelers before they board U.S.- bound flights. CBP officers inspect all U.S.-bound travelers on those flights that are precleared at the 15 Preclearance locations at foreign airports—which serve as U.S. ports of entry—and, if deemed inadmissible, a traveler will not be permitted to board the aircraft. CBP also operates nine Immigration Advisory Program and two Joint Security Program locations, as well as three Regional Carrier Liaison Groups, through which CBP may recommend that air carriers not permit identified high-risk travelers to board U.S.-bound flights. CBP data showed that it identified and interdicted over 22,000 high-risk air travelers through these programs in fiscal year 2015 (the most recent data available at the time of GAO’s report). While CBP tracked some data, such as the number of travelers deemed inadmissible, it had not fully evaluated the overall effectiveness of these programs. GAO recommended that CBP develop a system of performance measures and baselines to better position CBP to assess program performance. As of December 2018, CBP set preliminary performance targets for fiscal year 2019, and plans to set targets for future fiscal years by October 31, 2019. GAO will continue to review CBP’s actions to address this recommendation. Previous attempted and successful terrorist attacks against the United States have raised questions about the security of the U.S. government’s screening and vetting processes for NIVs. State manages the visa adjudication process. DHS seeks to identify and interdict travelers who are potential security threats to the United States, such as foreign fighters and potential terrorists, human traffickers, drug smugglers and otherwise inadmissible persons, at the earliest possible point in time. DHS also has certain responsibilities for strengthening the security of the visa process. In 2017, the President issued executive actions directing agencies to improve visa screening and vetting, and establishing nationality-based visa entry restrictions, which the Supreme Court upheld in June 2018. This statement addresses (1) data and information on NIV adjudications and (2) CBP programs aimed at preventing high-risk travelers from boarding U.S.-bound flights. This statement is based on prior products GAO issued in January 2017 and August 2018, along with selected updates conducted in December 2018 to obtain information from DHS on actions it has taken to address a prior GAO recommendation. GAO previously recommended that CBP evaluate the effectiveness of its predeparture programs. DHS agreed with GAO’s recommendation and CBP has actions under way to address it.